Elect India gives you nominated candidates’ information(cases, assets, education etc) for all the Lok Sabha constituencies. Are you all set to vote in the 2014 Indian Lok Sabha Elections? Do you know who you are going to vote for? If not, then Elect India is the application for you. 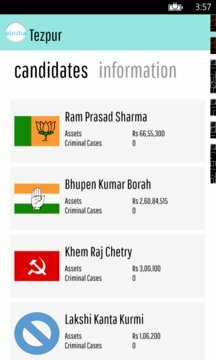 It gives you a list of all the candidates standing from your constituency along with extensive information about the candidates. This election don't just give away your vote, this election make an informed decision. 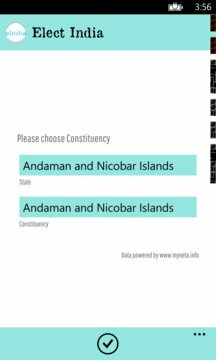 - List of all constituencies with information about State, Current MP, Last date of nomincation and Election date. If you don't see a list of candidates for your constituency or you don't see the candidate you are interested in, then it must be because the last date of nomination has not yet passed. Elect India!! A Better India!! An Informed India! !